In a grand building nestled against the Lehi foothills, a group of visionaries design tools for creatives—we know them as Adobe. In addition to its prominent, modern and gorgeous building, Adobe made a huge splash when it entered the Utah economy in 2009—it provided over 1,000 local jobs and prioritized community engagement as one of its top corporate responsibilities. This combination of community engagement and appreciation for artistic expression gave local artist Andrew Ehninger an idea: “What if local artists were invited to show their art in the Adobe space?” And just like that, the Utah Artists and Adobe project was born. Full disclosure: Andrew didn’t just come off the street and ask Adobe to consider this idea. His lovely wife, Shauna Ehninger, has worked for Adobe since it first opened its Utah location in 2009. The Ehningers are quite involved in Utah’s creative communities and are always looking for ways to volunteer and support the arts and culture in Utah. As Andrew visited Shauna at work over the years, he was inspired by the architecture and design of the Adobe space—but as an artist and art educator, his keen eye saw specific spaces that begged to display art. In October 2015, Andrew approached the Adobe team with his idea. “They were thrilled and eager to get the ball rolling,” he says. He immediately began to work on locating specific exhibition spaces with natural light and good foot traffic, as well as identifying artists to be part of the inaugural show. 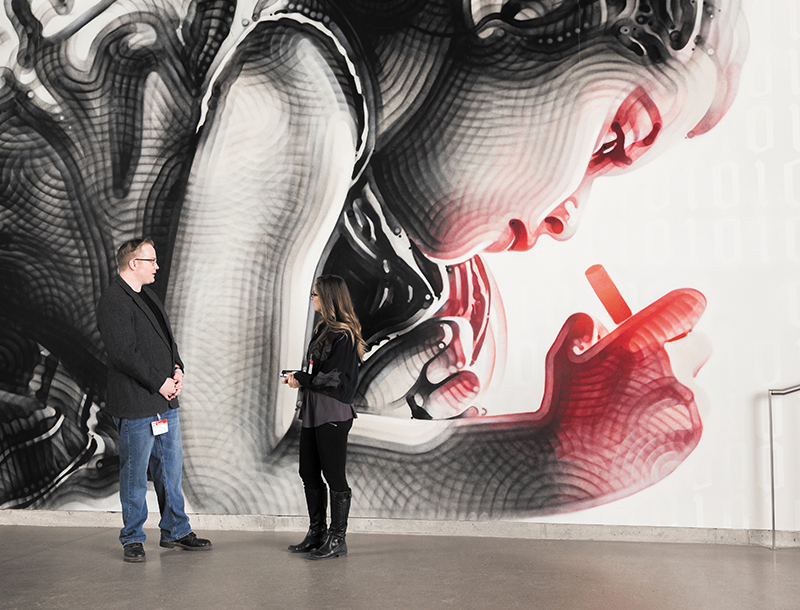 By January 2016, Adobe was hosting its first public art opening. Adobe stands on the pillars of quality communication and the endless possibilities of creative voices, so it’s no surprise that in 2006, they created a unique business unit known as Behance. In their words, it’s “a platform to remove the barriers between talent and opportunity.” Artists create a profile and upload images of their work, and companies peruse the site for a particular look—or they can post job opportunities when they need creative content. Andrew uses this site to curate an online gallery for artists to submit their work, five pieces at a time, for the revolving Adobe shows. Andrew reviews the work and then notifies the artists. “The Behance site allows the artists to see what’s been submitted and what we’re selecting,” says Andrew. “I try to leave comments and give everyone feedback.” Currently, the work on display in Adobe consists of 2-D pieces, but there has been talk of using existing screens in the building to showcase digital works, and Andrew would love to explore the potential of showing sculptural pieces. Adobe’s mission is to “make the tools to enable designers and developers to share their creativity with the world.” The Utah Artists and Adobe program is a wonderful opportunity for the world to respond with content created to inspire Adobe to keep creating for the creatives. The next Utah Artists and Adobe public opening, featuring a new roster of local artists, will be held Thursday, May 12. To learn more about the program and to submit works for review, visit behance.net/adobeUTlocalartists.